Love or hate it, the Singer 500a is easily one of the most iconic sewing machines ever made. Designed during the height of America's space craze with a full complement of futuristic style-lines accented by brown and gold, this retro sci-fi relic is aptly nicknamed "The Rocketeer." So what make it so great? For starters, this Slant-O-Matic, like the 401a, builds upon the basic shape and architecture of the 301a. Like its predecessors, the Rocketeer is solidly built with a lightweight aluminum chassis and uses a low amperage, gear driven motor. Like it or not, Singer really pushed the design on the Rocketeer, opting for a sleek and streamlined look. While I find the design philosophy somewhat of a contradiction, it is not without its charm. The silhouette is rounded while simultaneously angular. And while clear efforts have been made to neatly tuck components out of sight, one can't help but stare at the two gargantuan, bike-helmet shaped knobs taunting you as you sew! The top cover flips up to reveal two spring loaded spool holders, an internal bobbin winder as well as ample instructions on how to use its cam system. This is really cool in theory, less so in practice, as the clam shell top has a tendency to flip open when you tilt the machine and is not the sturdiest in construction. Furthermore, while Singer included a single stow-a-way spool holder that can be used while the clam shell is closed, there is no way to sew with twin thread spools with the lid down. Speaking of twin needles, the 500a is double needle capable--meaning you can load two single needles side by side for twin needle sewing. The advantages of this configuration are numerous, as it allows you to mix and match different needle sizes for mixing types of thread. There is still only one upper tensioner and bobbin thread though, so don't go too wild! The 500a is not only zigzag capable, but both externally and internally cam driven. These cams are used to produce a variety of functional stitches and decorative patterns. Singer's external cams were made of bakelite and are called Fashion Discs. These are fitted to specific classes of machine models. Earlier models, were of the single cam variety, while later models included 'flexi-stitch' patterns which is a fancy name for double cam. The 400, 500, 600 and 700 series machines use the type B, black, top hat, external cams which load directly into the top of the machine. Twenty three type B cams were produced, but the last, a basting stitch cam, only works with the Touch & Sew models. The 500 series Rocketeers come in 2 varieties: the 500a and 503a. The 503a is a stripped down version of the 500a without an internal cam stack and only uses external cams. This greatly simplifies things, as every cam will now produce a unique stitch. There is a lot of confusion surrounding the Singer cam system and that is largely in part due to the overlapping designs available both via internal cam stack and external Fashion Discs. I will try my best to clarify. There are a pair of settings on the 500a. Push the gold knob and twist to select settings A thru J on the left and pull the brown knob and twist to select settings K thru Special on the right. The special setting is used to load the inserted Fashion Disc pattern. Fashion Discs cannot be removed or inserted while using the Special setting. These settings control two cam fingers that ride on two columns to the left of the internal cam stack. It is important to note that both cam fingers are in play simultaneously to create a variety of patterns. Singer clarifies by further grouping these patterns into primary patterns and combination patterns. Primary patterns in essence only use one cam finger (K thru special) while the other finger controls needle position (A = left, B = center and C = right). This frees up the brown lever (not truly a stitch width lever, but deceivingly similar) to control the width of the pattern. Secondary patterns, on the other hand combine both cam fingers to produce a pattern. This causes the brown (stitch width) lever to ostensibly behave differently. The lever now acts as a ratio controller, flipping the lever all the way to (width) 1 will use the gold setting 100% and the brown setting 0% while flipping to 5 will utilize the gold setting at 0% and brown setting at 100%. A setting of 3 would be a perfect 50/50 blend of the gold and brown settings. What this means is that you may not get the width control you would expect when using combination patterns. So now what? The answer is simple, it is far less confusing to stick with using the 7 built in primary patterns which happen to include both blind stitch and multi-step zigzag. The good news is, the external cams are themselves, primary patterns! So don't go tossing your seemingly duplicate discs. These pattern discs offer far better control and are more versatile than their combination pattern counterparts. Whew! That was a mouthful. It's quite a lot to take in at first but I promise you it is a marvel to see in action. Okay! Enough about cams! The Rocketeer features a clearly marked adjustable presser foot pressure dial tucked away in the nose along with a threading cheat sheet which Singer has since revised. In the revision, Singer advised operators to bypass the extra set of thread guides that run parallel to the bed just above the upper tension. Stitch length adjustment and upper tension control is pretty standard fair with added space aged flair. A shielded light prevents surprise burns to the hand. 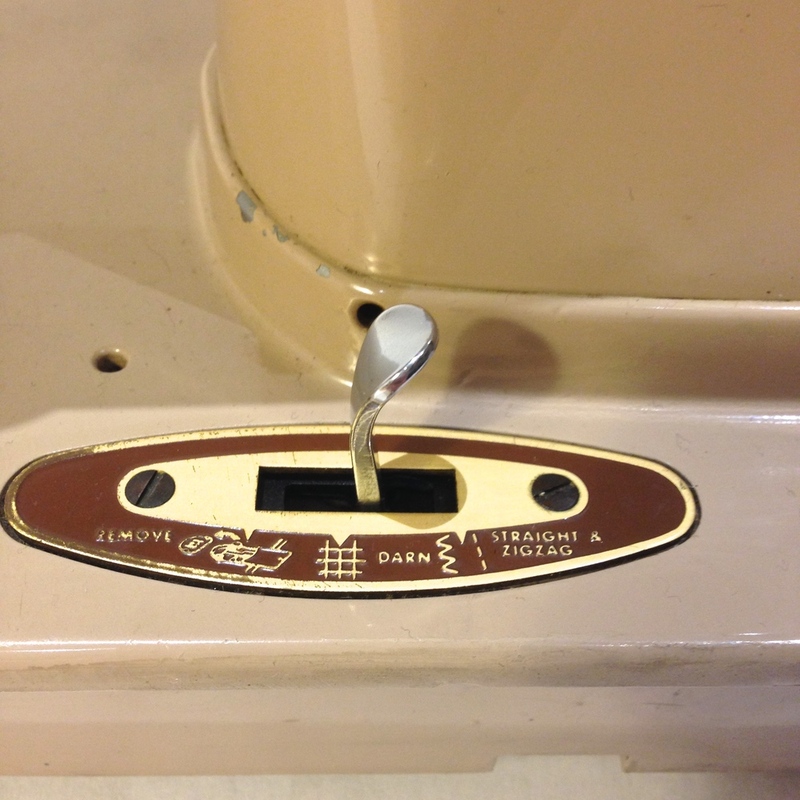 Rather than lowering it's feed dogs, the 500a uses a unique quick change needle plate that raises for darning. Slide the needle plate lever to the middle position for darning and all the way to the left to remove it. This mechanism takes a little getting used to, especially when sliding off the needle plate, as the feed dogs can get in the way. While I personally prefer a true feed dog drop, I love the convenience of the quick change needle plate. It makes going from straight stitch to zigzag a snap. It is also one of the reasons why the Rocketeer has such a high quality straight stitch. The German 400 series G models (411g or 431g), have a different chain stitch plate as well. The 500a comes with a nifty accessory case which has plenty of storage for your slant shank feet, straight stitch needle plate, extra bobbins and cams. There are no shortage of amazing slant shank attachments to be had, from monogramers to buttonholers. More on this in a future post! All this tucks into the plastic carrying case which requires your machine to be mounted into a base. It is worth mentioning that a plug extension is required to fit the Rocketeer into the base. *There is one extremely durable, non-metal gear just behind the hand wheel in the 500a and plastic spool pins. In summary, the Singer Rocketeer is a robust and feature rich machine that suffers from a relatively high learning curve. One can certainly argue the dual pattern selection system is more trouble than it's worth. Don't be intimidated though, this unique piece of history will serve you well should you put the time in to learn its quirks. Sleek or superfluous? Which side of the fence do you fall on? Is this truly the sewing machine of tomorrow? Let me know what you think!